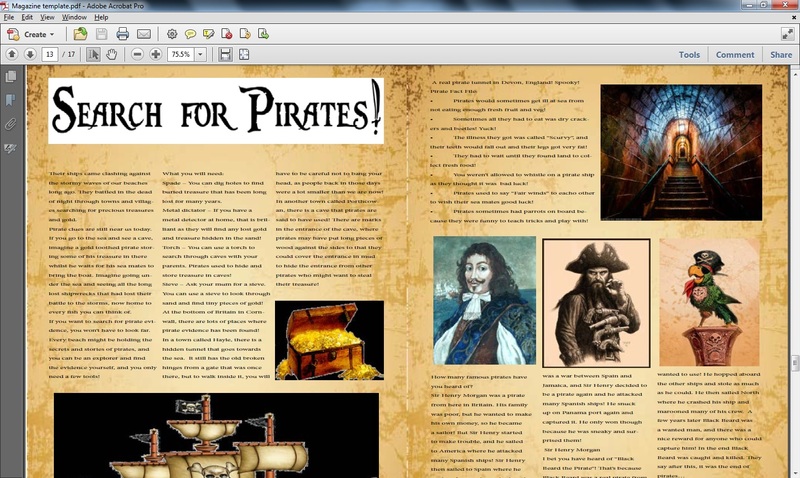 Above is the mock template of my pirate feature, made in InDesign. The selected picture in the template are mock images from Google, as an idea of what will be illustrated by an illustration student friend of mine. My illustrations will only be based on these selected images, and will be sketched in design and watercolour. The Background I selected for my feature is a scroll type, stained image. It looks like an old piece of parchment paper, stained with years of storage. I chose this background because I didn’t want a plain white background, and wanted the feature to look as aesthetically pleasing for kids as it can be. I also want the main base length of text to be in a simple, pirate font, but not too curly, to keep the pirate theme flowing, but not to overcomplicate things. The main title will be in big pirate font, to keep the feature looking authentic and exciting. I plan to edit this feature by perhaps moving the images to a different position, and editing the sizes.